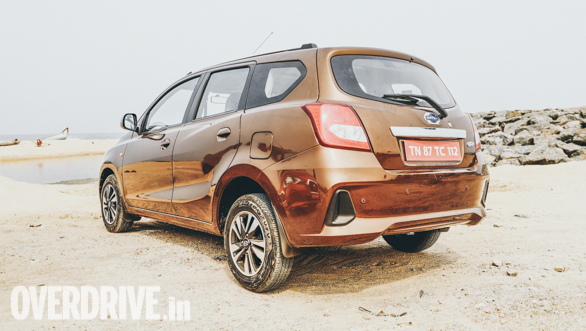 The Datsun Go hatchback and it's MPV derivative the Go+ have had an enigmatic run in the Indian car market since they made their debut in 2014. The revival of a storied Japanese brand, a low entry price and good interior space were instant positives. 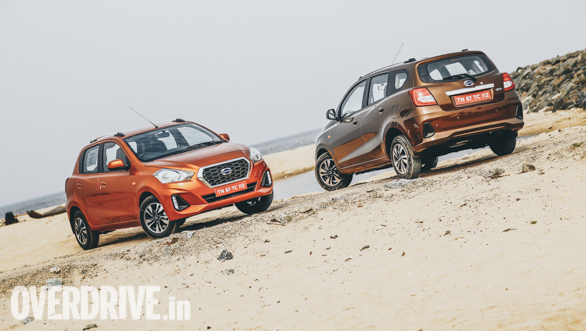 But there have been valid doubts regarding the cars' safety proposition and the sales and service experience has also not been up to industry standards. Consequently, this update comes as a much needed shot in the arm for the Go/Go+. The Go's styling was always neutral and this update doesn't deviate from that trait. The front bumper on both cars has been reworked. These get grey housings below the headlamps to accommodate the DRLs, also a new addition. The more noticeable sculpting on the front bumpers also makes this the most desirable angle to view the two cars. 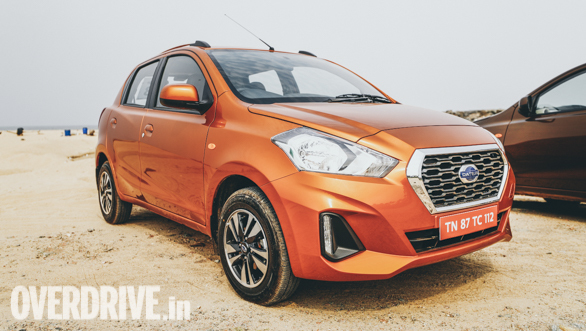 The grille design has been slightly tweaked as well as the headlamps. The side profile's only change is the new 14-inch diamond cut alloys on the top-end trims. Datsun could have replaced the pull type door handles with a modern setup but the shoulder lines and the other crease running along the lower half of the doors dissipate some of the visual bulk. 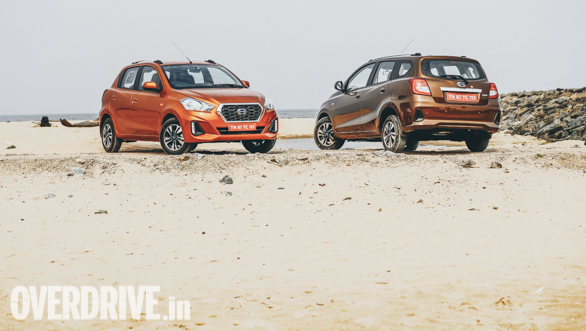 Obviously, the extended roof and quarter glass for the third-row seats in the Go+ are the most noticeable difference between the two cars. The rear bumper is the other difference between the two. The Go hatchback gets a grey strip below the number plate and a chrome strip at the bottom of the boot lid. The Go+ gets black polygonal inserts at the rear in place of the horizontal strip. All of these new changes are well executed and don't seem forced or overdone. The styling on both cars will never be a point of contention but these new additions seem to uplift the whole package. The new orange paint option available on the Go is especially good to look at. The Go+ gets a new shade of brown. This is where Datsun concentrated the most with this facelift. We think the new design is much more modern and up to the standards we have come to expect in this segment. The imitation carbon fabric patterns on parts of the centre console, above the glove box and door handles do well to break up the broad expanses of hard plastic that make up the dash. Fit and finish are also good, we couldn't find any inconsistent panel gaps. The cabin plastics are understandably not of the highest standard, given the price point this car competes at. 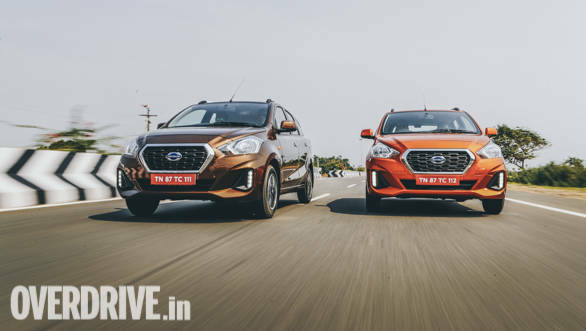 But Datsun could have used this opportunity and improved the sense of perceived quality, to round off the sweeping changes it has made on the inside of the two cars. The seats could have been better too. The cushioning is hard and there isn't enough lateral and under-thigh support. 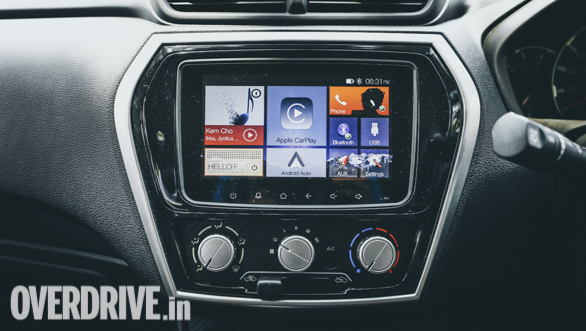 The new seven-inch infotainment system is a huge step up from the docking system that the Go initially came with. This system comes with a full HD screen with crisp responses. The Blaupunkt unit has a tile type interface with all major functions listed on the home screen. 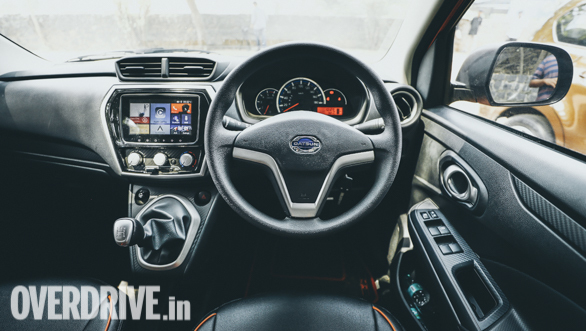 We found the system to be an intuitive one and a big step up from the Media Nav systems seen on other Renault-Nissan cars like the Kwid and Capture. The USB port though is difficult to access and the sound quality from the two speakers is average at best. The instrument cluster now gets an analogue tachometer which is much easier to read that the digital one from before. Interior space is class leading and three adults can be seated in the second row, for short durations at least. Headroom might be an issue for six-footers but legroom should be good for all but the tallest of individuals. The third row in the Go+ is best reserved strictly for children. We found the space very cramped, with us sitting in a knees up position and our heads brushing against the headlining. The third bench folds flat completely though, freeing up a sold 347 litres of luggage space. 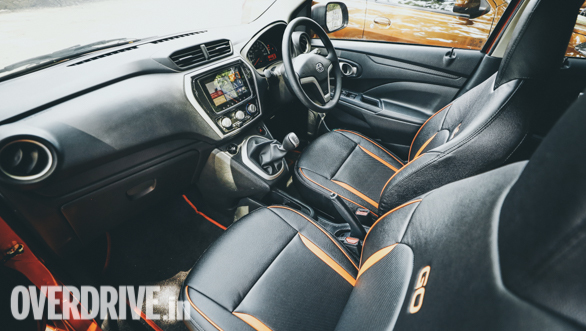 We feel buyers should consider this as the primary criteria for choosing the Go+ over the Go, the third-row seats should be best reserved for occasional emergency use. Mechanically, the Go and Go+ remain unchanged, they continue to be based on the V-platform from the Micra. On paper, the 1198cc, three-cylinder petrol motor with 68PS and 104 Nm seems par for the course in this segment, but the situation is quite different in execution. The power is concentrated at the higher reaches of the rev band, meaning that if you are looking to make brisk progress, you will have to rev out the engine. The gearbox's long throws and mushy shift action had us double-checking on more than one occasion, in both cars, to see if we had managed to slot in the right gear. 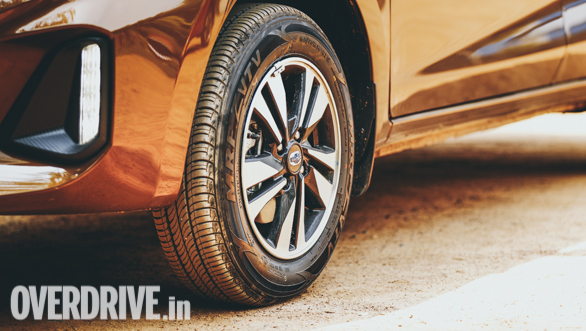 The brakes are progressive and provide good feedback, easily handling panic stops. The upsized 14-inch wheels are a welcome new addition and have improved stability, but the Go twins still feel skittish at highway speed, never really settling down. This scepticism is aggravated further by the high levels of engine, tyre and wind noise that we felt while driving the two cars at speed. This is a missed opportunity by Datsun, the Japanese carmaker could have worked on this during this refresh. 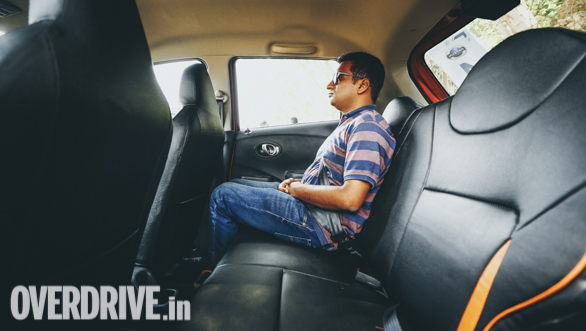 Improved NVH levels would have added more effect to the other major improvements that have been made in the cabin. The two cars redeem themselves to an extent in urban driving. Aside from the slightly springy clutch, the cars perform well in these conditions. Visibility from the driver's seat is good, which let us place the car easily on the road. The steering is light and though not very precise, allows for a good amount of lock, again aiding in manoeuvrability in tight Indian city roads. Ride quality is also good too, the Datsuns soak up small bumps, ruts and other undulations with ease. Only the larger bumps and crests cause the cars to become unsettled. 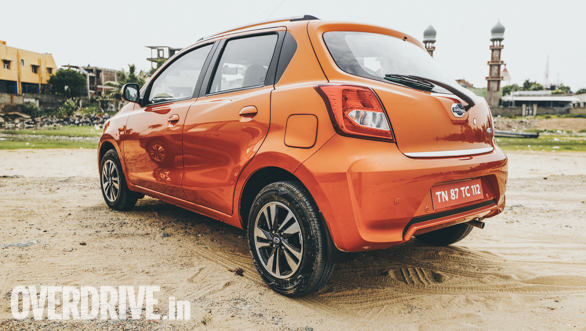 The pre-facelift Datsun Go and Go+ had receive flak for sidelining safety in the pursuit of affordability. The company has tried to fix this complaint. In a significant step up, the new cars come with two airbags and ABS as standard. 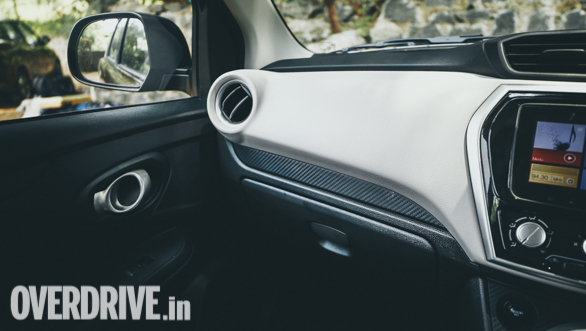 The company claims they have reinforced the cars' structure to comply with the new safety norms coming into effect next year although questions regarding the two cars structural strength remain unanswered until a new round of crash tests are conducted. 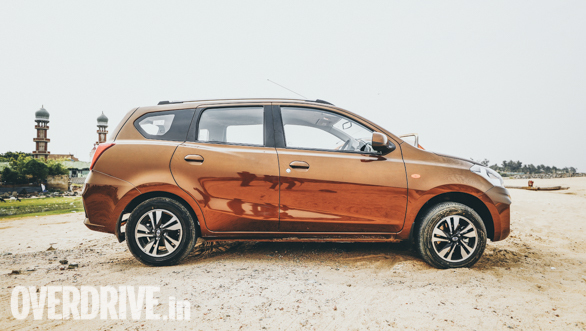 Prices for the updated GO start at Rs 3.29 lakh while the updated GO+ MPV retails from Rs 3.83 lakh onwards. 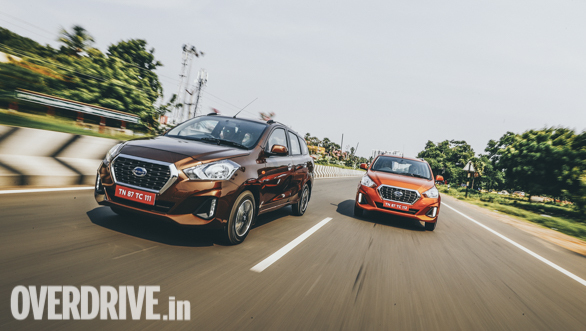 The pricing is competitive for the amount of car on offer, especially in the case of the Go+, but this also means that the Datsuns will go up against strong competition in the form of the Tata Tiago, the Maruti Suzuki Wagon R and the new Hyundai Santro set to be launched in the next few weeks. 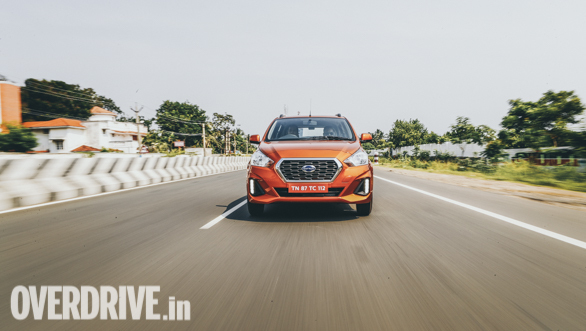 The improvement made in this facelift shows that Datsun has taken into account feedback from the last car and there has been some level of introspection. The new changes are hits rather than misses. But the issues for the Go and Go+ are more than skin deep and its competitors outperform them in most aspects other than possibly interior space. A full generation change is in order for the two cars, with a mechanical package that is sturdier and more refined.